Proudly and actively serving Lee’s Summit, MO and the surrounding areas, Royal Door is a skilled provider of garage door maintenance and repair services, and as well as garage products for residential and commercial establishments. Our services include garage door repairs and replacements, new installations, accessories, and maintenance updates; we can do it all! At Royal Door, customer service is our number one priority! We sincerely value each and every one of our customers, no matter how large or small the job. We promise your experience with us will be affordable, pleasant, and satisfactory. Most don’t realize the long list of benefits your garage door brings to your home or business. A garage door should enhance your curb appeal, save on energy, and, most importantly, provide security. Our premier products and accessories and annual maintenance services will ensure your loved ones are protected. As a Lee’s Summit native, Justin has always had an entrepreneurial mentality. When he was 12, he started his own gumball vending machine business and was making up to a few hundred a month in quarters and dollar bills. As an accomplished 12-year-old he knew he wanted to own his own successful business as an adult. Right out of high school Justin worked full-time installing garage doors. He noticed a lack of quality customer service and effective garage door repair maintenance in the industry and wanted to be able to help residential and commercial areas not only at a reasonable price, but quickly and effectively. This is how Royal Door got started. 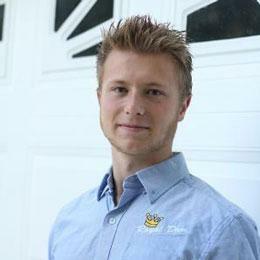 With years of experience and glowing customer reviews, Justin prides himself on being a local garage door business owner and contractor. His appreciation for his business, his work, and his customers makes Royal Door such a trusting and dependable choice. Still have questions? Contact Justin today to learn more about Royal Door and the services provided. “Entrepreneurial dreams began early for Royal Door founder, Justin Schulmeister” featured in Link 2 Lee's Summit. Royal Door services garage doors across the Kansas City metro area. If you're in need of garage door repair, installation, maintenance, or other services, contact us for more details! Check out some of our key service locations below.